One of the best things about motor shows are the preposterous concept cars that will never see the light of day and serve only to showcase the manufacturer’s technology. 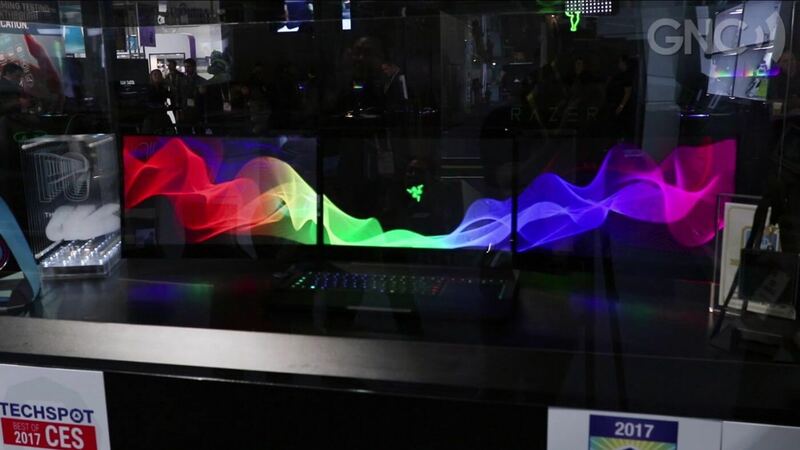 Razer are verging into this territory with a bonkers triple 4K screen laptop, codenamed Project Valerie, where the three screens combine to give a whopping resolution of 11520 x 2160. And get this….the screens will automatically expand and collapse – so cool. Aimed at the (very) serious gamer or esports player, it’s totally awesome and no doubt will have a price tag to match when (if?) it goes on sale. When it comes to computer gaming, the standard thinking is that you’ve got to have a massive, overpowered desktop system if you really want to be able to play. After all, modern games are chock full of high-resolution audio and graphics files that require a lot of horsepower in order to be properly rendered. And while most of the low-end laptops you’re likely to find at the local office supply store won’t really excel when it comes to gaming, companies like MSI are hard at work developing gaming systems that are as powerful as they are portable. At CES 2016, MSI introduced its new GS72 Stealth Pro laptop, the successor to its popular GS70. 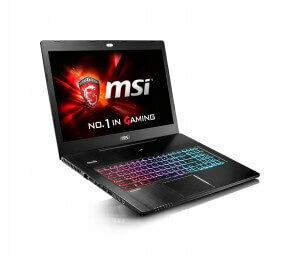 Measuring in at 0.78” thin, the GS72 is MSI’s slimmest and lightest 17” gaming notebook and sports an ultra-high resolution 4K display in a form factor chassis. There is also a non-4K GS72 Stealth option. Both versions of the computer are expected to be on the market in early 2016. 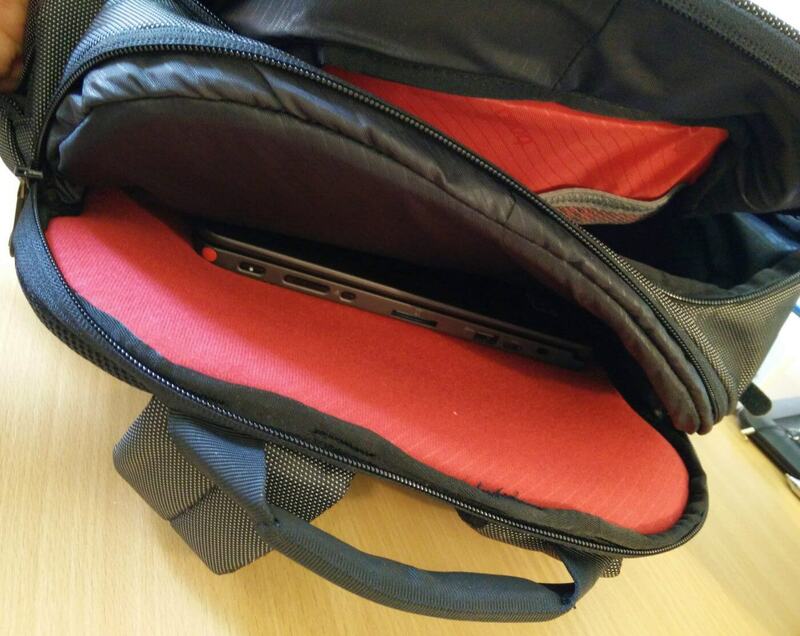 On review here is the Booq Cobra Laptop Briefcase, a lightweight and high-spec laptop bag. 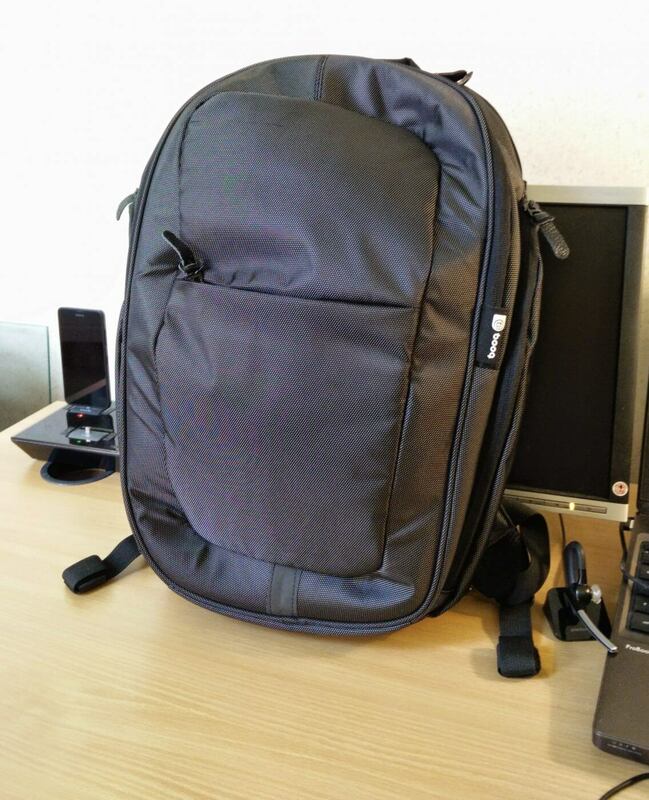 Unlike some of the other Booq bags that I’ve reviewed here for GNC, it’s in the more traditional style for those circumstances where a rucksack looks a little bit too casual. Designed for laptops with screens up to 16″, it’s made with ballistic nylon complimented by lower leather trim, meaning it looks good but is durable too. As you’ll see from the pictures, the YKK zips are mostly on show in bright steel, though the main laptop compartment has a covered waterproof zip. Zipped pocket with Booq’s corporate copper-coloured inner, suitable for an A5 size notepad or tablet. Open pocket with soft jersey inner. Additional easy access pockets within suitable for purse, wallet, mobile phone, MP3 player or tablet. Useful when on the go but gear may fall out. Big zipped pocket with copper inner. Further internal pockets for A4 notepad and bigger devices, perhaps external hard drive, PSU or even lunchboxes. Couple of pen pockets and a keyring too. Handily, the zip on this goes at least three quarters of the way down the side of the Cobra, so it opens wide. Not sure you’d quite get a change of clothes in here but it’s close. Big hidden waterproof zipped pocket, with soft padded lining. The is obviously intended for the main device and it comfortably took a big Toshiba Satellite Pro. Simple open pocket with copper inner, big enough for a magazine or A4 notepad. There’s padding and protection between the compartments, so gear is going to be looked after wherever it is. Booq’s copper-coloured inner may not be to everyone’s taste, but it’s much easier to find stuff in the depths of the pockets. To some extent the pictures don’t do the colour justice – it’s better in real life, as they say. For carriage, the Cobra’s well covered. To start with, there’s the two handles which are comfortable without being overly broad, and attach to the bag with seatbelt-style webbing. The handles fold back into the bag when not needed, keeping the bag neat. Then there’s an over-the-shoulder strap, made from similar webbing with a large shoulder pad and metal clasps at each end. And finally there’s a webbing loop that can be passed over the handle of a trolley suitcase to sit the Cobra on top. 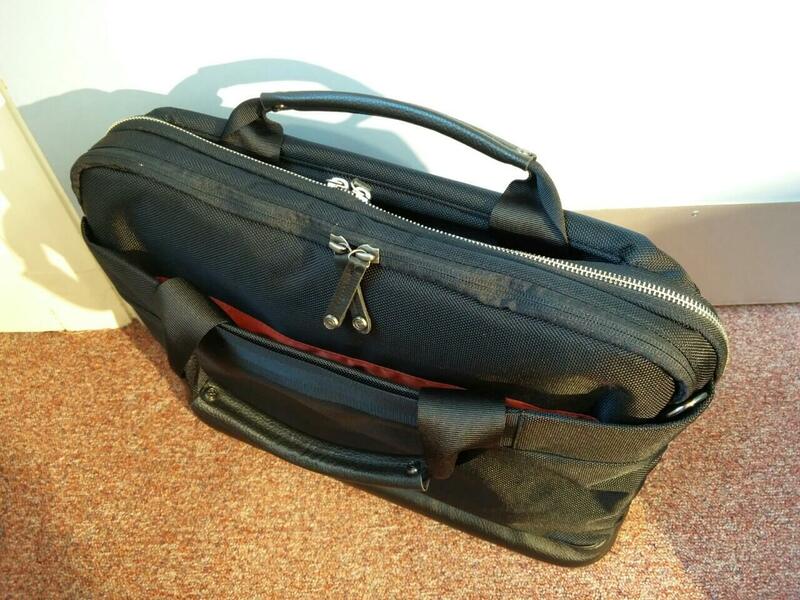 Even better, the Cobra has a flat bottom, so the bag stays upright when put down (mostly!). 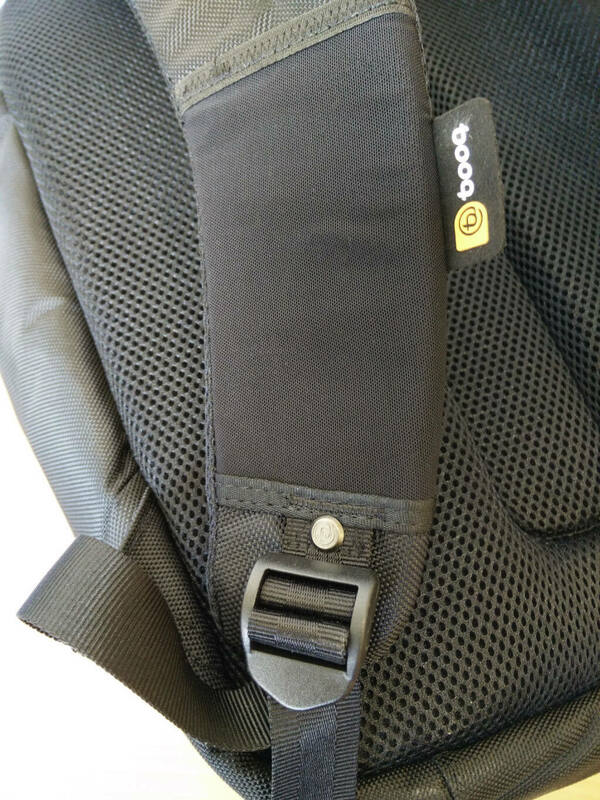 As with all Booq bags, the Cobra is tagged with a Terralinq serial number, which is Booq’s “lost and found” service, giving a much greater chance of being reunited with lost gear. Let’s hope you never need to use it. At US$295, GB£210 or 295€, the Booq Cobra isn’t an impulse purchase so I imagine the briefcase will be protecting some high-end gear. The Cobra seems a quality product – well finished, no lose threads, metal fixtures – and it’s perfect for cossetting a MacBook Pro or gaming laptop while travelling. Available on-line (US, UK, Europe) and other good retailers. Thanks to Booq for the review Cobra. The history of mobile applications dates back to simple games such as Snake, Pong, Tetris, and Tic-Tac-Toe included with candy bar phones. As phones became “smarter,” Windows Mobile phones of the mid-2000’s and others included the ability to install third-party software, both paid and free. Next came the era of the high noise level platform app stores that we know and love/hate today. There are tons of both free and paid apps. Some apps are useful to accomplish very specific, pointed tasks with high efficiency. Others apps are arguably less than useless. 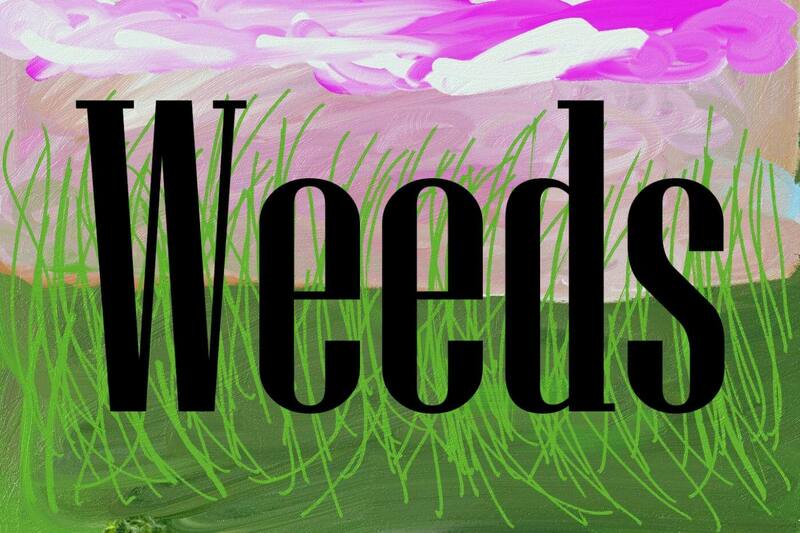 The good and the bad, the useful and the useless are packaged together in a cacophony of brightly-colored graphics and flowery sales language, all on equal footing and demanding attention. App discovery is often painful, unpleasant and risks device app bloat. Mobile device ownership and management requires a learning curve. In phase one, the mobile device novice is at high risk of downloading seemingly every app encountered, while actually making use of very little of that which has been installed. Phase two of the learning curve is typically marked by out of storage memory errors. Phase three requires the user to decide which useless apps should be deleted so that the mobile device can continue to be updated and/or functional. When deleting apps, there is a tendency for the user to hang on to installed apps if there’s even the most remote of chances that the user might conceivably use the app. The key test to determine whether a particular app should simply be deleted is to ask yourself whether or not you would reinstall it after a factory reset. It should be noted that apps that the user has paid for will tend to have a higher psychological value placed on them, regardless of whether they are actually useful or not. In this noisy mobile app jungle, where crap is right alongside cream, people are trying to squeeze the most out of their mobile devices, to extract the maximum productivity. Mobile devices make great content consumption devices. Proof is all around us. At any given moment when people are around, how many of those people are absorbed with their mobile devices? As mobile devices become ever more powerful, the next step in the evolution of the mobile device usage learning curve is revolving around increasing demand to accomplish real-world productivity tasks. While some productivity tasks can be accomplished, others are difficult or impossible – not because of computing power limitations – after all, today’s mobile devices often have quite powerful processors – no, because of software limitations. Mobile device operating systems have grown larger and more sophisticated along with the more powerful processors. However, there is a problem plaguing both iOS and Android in the form of an app gap. Apps are wannabe pretenders when it comes to genuine software sophistication. No mobile device apps can compare on equal footing with desktop computer software. Both major platforms – iOS and Android – suffer from this problem. There is nothing stopping software vendors from developing highly sophisticated mobile software, other than the fact that it’s typically just not worth it. For whatever reason, mobile device owners have a pervasive “it has to be free or very low cost” mentality. We are willing to spend upwards of a thousand dollars or even more for a high end mobile device, but balk at the idea of having to pay more than a few dollars for single apps. If you have ever tried to push a mobile device to better take advantage of its powerful processing capabilities, you quickly run into a problem. Go beyond a certain level of task sophistication, and the apps typically fall flat very quickly. The ultimate test for mobile apps is to take a mobile device and plug it in to a 1080p or higher monitor. Attach a keyboard and if it’s an Android device, attach a mouse or trackpad. Try to use the mobile device and the installed apps like you would a full computer. For example, try to push the experience to its limits by editing a long, complex video and see how well it goes. The mobile software will play back high resolution videos without any trouble at all, but try to do something really productive and things quickly fall apart. The problem isn’t the processor, but the software. The mobile app gap situation doesn’t look as if it will improve anytime soon. In the meantime, as mobile device owners and users there are a lot of questions we should be asking ourselves. How much are you willing to pay for mobile device apps? What has been your experience? Have you ever paid for an app and then realized later that it was a waste of money? What is the most you have ever paid for a mobile app and why? Why are people willing to pay sometimes hundreds of dollars for sophisticated commercial desktop class software without batting an eye, yet close their wallets when it comes to paid apps for mobile devices? Do people perceive mobile devices to have as big of a potential payoff as a desktop or laptop? If mobile computing devices don’t have the same payoff potential as a desktop or laptop, then why not? What is the difference between the two systems? What can be done to increase the potential payoff value of mobile computing devices? As technology relentlessly moves forward, functions continually consolidate and devices get smaller as capabilities increase. This march forward has caused form factors to shift. The first desktop computers were relatively large and boxy and certainly not portable. Over time as laptop computers improved, desktop sales began to fall. Imagine the succession of devices you have gone through over a long period of time. They start out as clunky and single purpose, and over time as the tech improves they get smaller and some of them are simply absorbed such as camcorder and point-and-shoot cameras. Imagine them endlessly changing and continually morphing as your expectations changed over long periods of time. There is an ongoing war not only between devices, their capabilities and their form factors, but there is also a war going on inside of each end user of these devices as to which one is better and performing specific tasks. The first mobile phones were large and clunky. Mobile phones went through a long progression over time of getting smaller as capability increased and eventually turned into the ubiquitous smartphones we know and love today. The ongoing warfront is now between smartphones, tablets running apps such as the iPad, and conventional laptop computers. Which one is better at performing what task? Up until about 2011, I did all of my mobile computing on laptop machines. I got an iPad 2 in 2011. I found the iPad 2 to be a great media consumption device, so between the iPad 2 and my Android phone, I gradually stopped using my laptops for all but real productivity tasks, where the iPad and other tablets really seem to fall flat. In 2013, I bought an iPad Air. In retrospect, I justified the purchase to myself thinking that the faster processor in the iPad air might enable me to move completely away from laptop computers altogether. Sadly, this was not the case. The iPad remains a great media consumption device, but as a productivity device it is still quite lacking. My primary use for computers includes writing articles, editing video, editing my websites, and recording and publishing audio podcasts. While it is possible to do all of these tasks on an iPad or an Android tablet, it’s an unnecessarily painful, slow experience necessitating jumping through multiple hoops. I believe many people did exactly the same thing I did, trying to turn the iPad into a small ultraportable laptop. The iPad makes a lousy laptop. 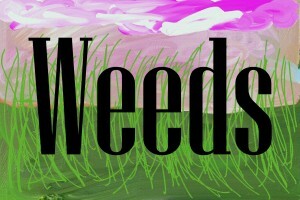 There is no mouse, and though the iOS apps are great for media consumption, the apps make lousy productivity impostors. The iPad makes a poor netbook. I believe that is why Apple forbids the iPad from using a mouse. The conventional laptop makes an inferior media consumption device. Beginning in May of 2014, a new entrant entered the ongoing device war. I believe a significant portion of the future of computing resides in the so-called 2 in 1’s. I don’t believe that conventional laptops or tablets running apps will go away, but I believe the 2 in 1’s such as the Microsoft Surface Pro 3 and above will eat into laptop and tablet sales. Apple has yet to enter this 2 in 1 market, despite the recently-announced iPad Pro. The iPad Pro running iOS apps will be a bigger iPad and thus a bigger media consumption device that can’t run genuine productivity software. I personally see a future for myself with a large screen smartphone, and a 2 in 1 tablet/computer, with some room left over for inexpensive mid-sized tablets that function as media consumption devices and offer mapping and GPS functions. I will allow my conventional desktop and laptop computers, the majority of them now-older out-of-date Macs, die of attrition as they inevitably quit working over time. 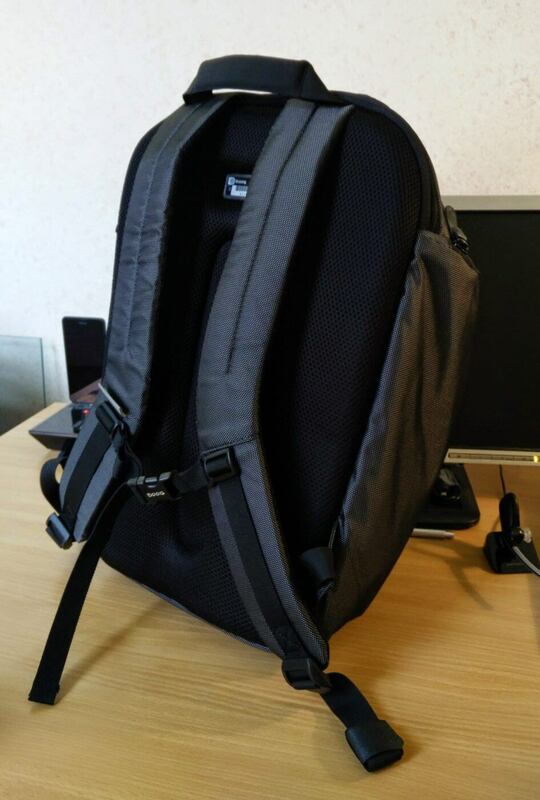 On review here is the Booq Boa Shift, a lightweight laptop backpack and brother to the Booq Taipan Shock reviewed a few weeks ago. 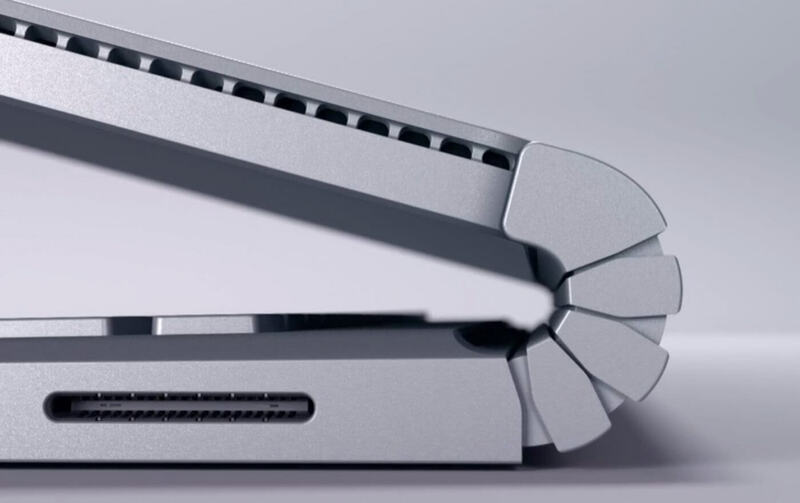 Cut from the same cloth, both physical and metaphorically, the Shift takes laptops up to 17″ compared with the Shock’s 16″, but there’s little in it terms of overall size at 46 x 34 x 20 cm. 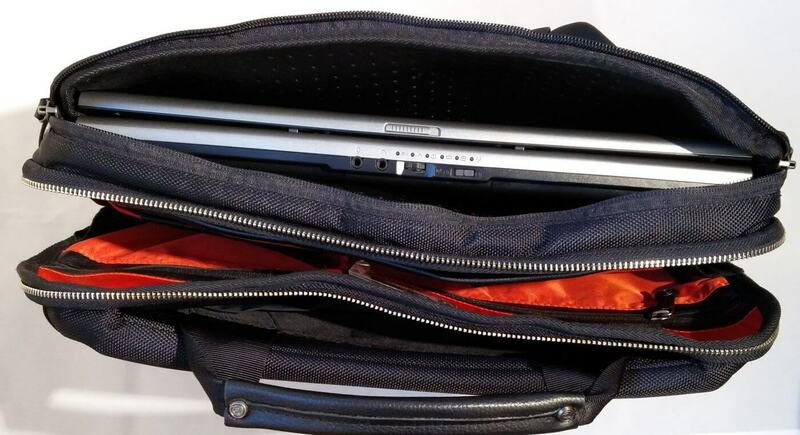 There’s plenty of room inside for the gadgets and gear, with a slim pocket for the laptop, a larger section for gear and a couple of outer pockets for easy access. It’s a svelte, streamlined pack when all zipped up. The outer material is 1680D triweave water-repellent polyester closed with YKK zips and all the stitching is neatly finished and taped over on the inside. It looks like a quality product – there are no stray threads or sticky zips. The specs say the Shift weighs around 1.4 kg (3 lb) which is heavier than the Shock and although I don’t have the benefit of the two backpacks side by side, the Shift does feel a little more substantial with extra internal pockets. 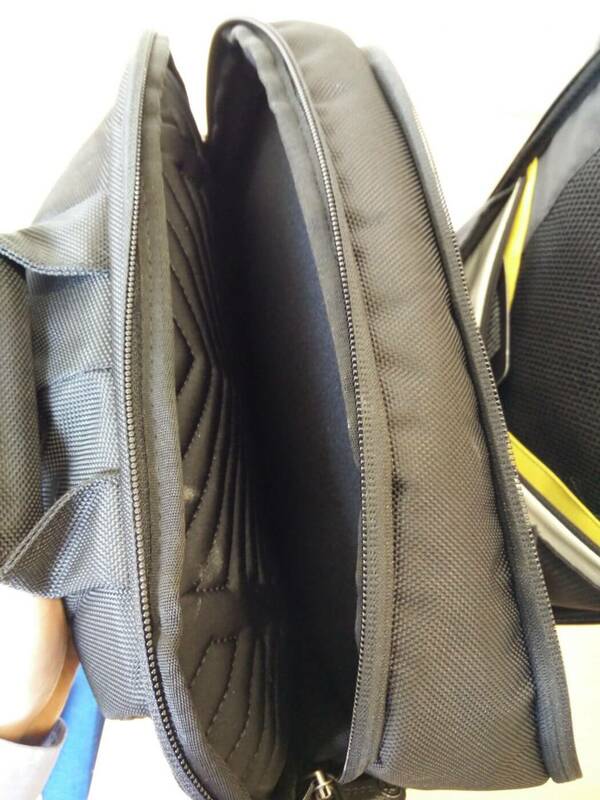 The dedicated laptop section is closest to the back side of the Shift and has padding on all sides. It took every laptop I had with ease, including a hefty HP ProBook with a near 16″ screen. My small Chromebook almost disappeared inside it. In the main section, there’s a selection of zipped pockets, netted areas, keyrings and pen-holders with plenty of room for books and lunchboxes too. The Boa Shift has flashes of yellow both inside and on the back. The main pocket opens good and wide for easy access to the insides. The Boa is loaded with features. To start with all the zips are YKK’s water-repellent versions, so once closed up the bag will keep gear dry in a rain shower, and the bag looks neat as there are no zip teeth showing. 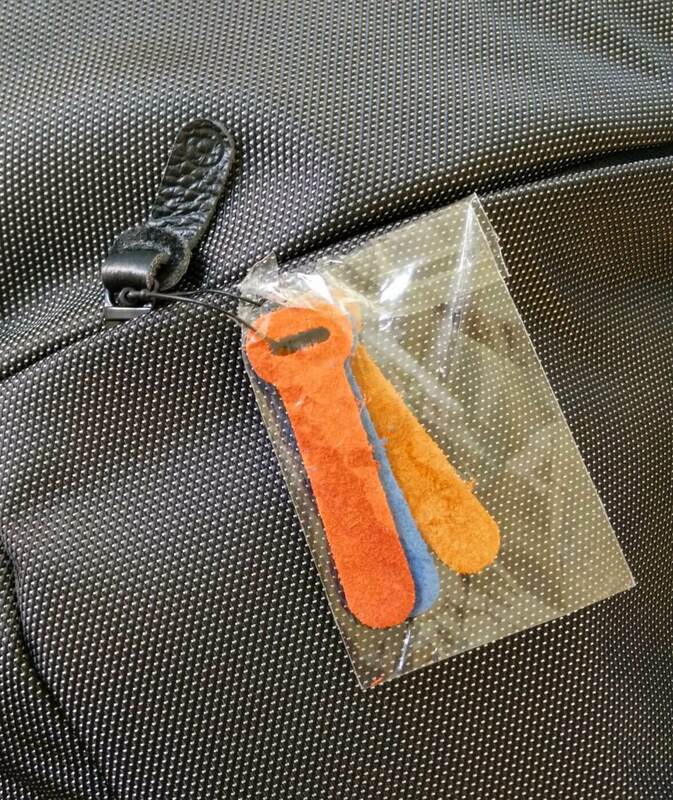 Each side of the bag has two open pockets which will take a small bottle of water or perhaps boarding passes. 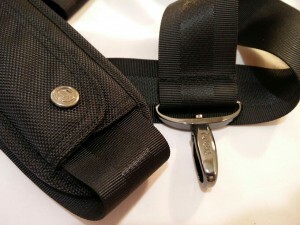 The shoulder straps have two small elastic pockets that can take small items, such as an mp3 player. On the rear, there’s a separate zipped pocket, just the right size for an ereader or small tablet. One final touch is a small separate zipped pouch for bits’n’pieces like headphones or credit cards. I can see it being handy travelling too, as you could put all the essentials in it and simply pull out the pouch before putting the Shift in the overhead bin. Comfort-wise, the shoulder straps are well padded and can be adjusted for fit. There are little loops on the end of the straps to help tighten when needed. There’s an airmesh back padding to help with the load while keeping cool. I loaded the Boa up with some books and lugged it around for a bit and there’s no complaints here. Finally, as with all Booq backpacks, the Boa Shift comes with Terralinq, a service designed to reunite lost bags with owners. 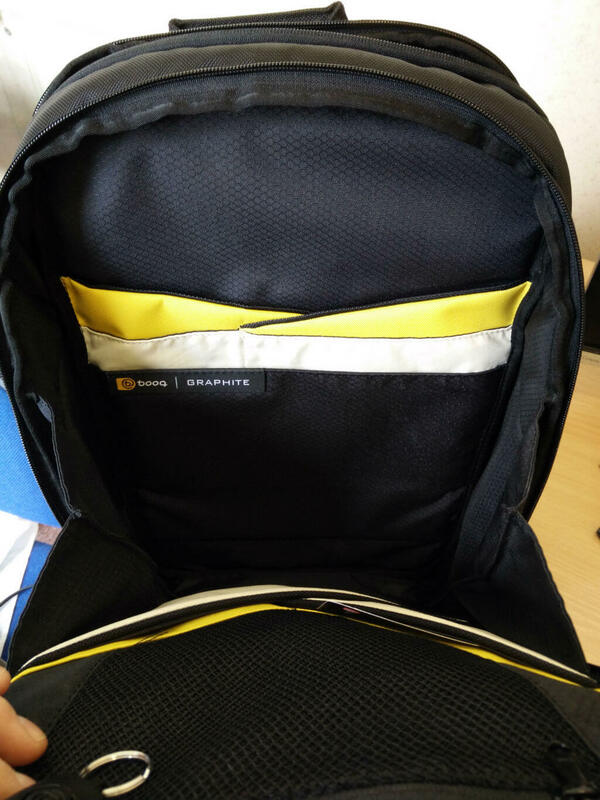 By pairing a serial number on the backpack with the purchaser, the Shift can be returned should it be found. 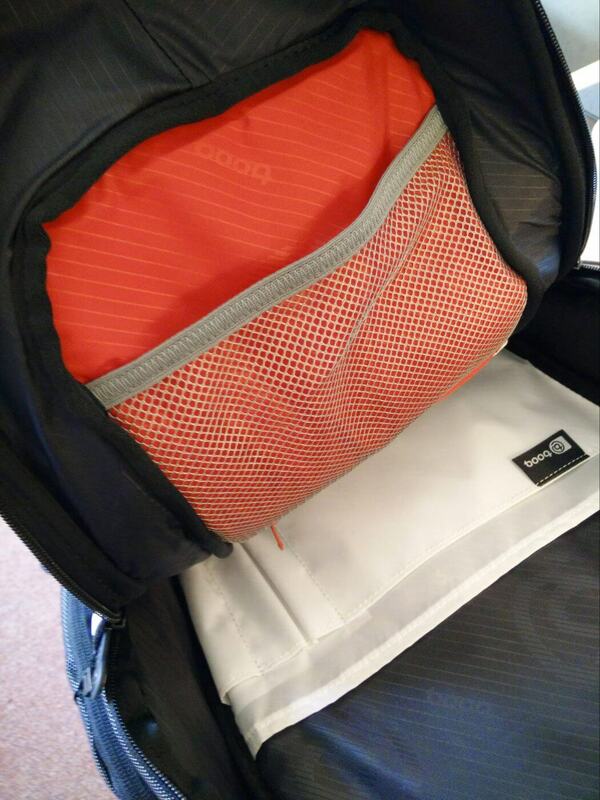 Overall, as with Taipan Shock, the Booq Boa Shift is a well-made backpack that has plenty of pockets and space for safely toting the biggest of laptops and all the gear that goes with them. The Boa Shift is available from Amazon.co.uk for around GB£120, which is pricey enough and given that the Shock is currently retailing for about half the price, unless you need that extra 1″ or so, I’d stick with the Shock. However, if size matters (or you want a more streamlined pack), take a look at the Boa Shift. Thanks to Booq for the loan of the Boa Shift. The Booq Taipan Shock is a lightweight laptop backpack for devices with screens up to 16″, designed to store the laptop safely in a padded section, placing all the accoutrements of mobile life in other pockets and compartments. 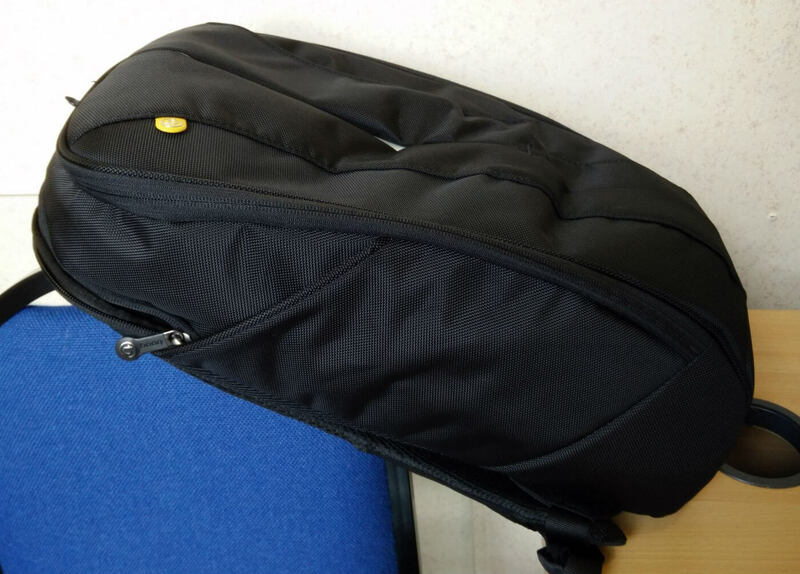 As can be seen in the photos, it’s a relatively big backpack at 46 × 33 × 21 cm giving it a large internal volume for plenty of gear. The outer material is 1680D triweave water-repellent polyester closed with YKK zips and all the stitching is neatly finished and taped over on the inside. The specs say it weighs just under a kilo. The dedicated laptop section is closest to the back side of the Shock and has padding on all sides with a flash of red material. The Shock easily took a chunky HP ProBook with a 15.6″ screen and a more svelte 13″ Lenovo Yoga looked almost lost inside the padded laptop pocket. In the main section, there’s a selection of zipped pockets, netted areas, pen-holders and slots for paper pads. There’s plenty of room for books and lunchboxes too. The Taipan Shock has loads of neat features. To start with all the zips are YKK’s water-repellent versions, so once closed up the bag will keep gear dry in a rain shower. 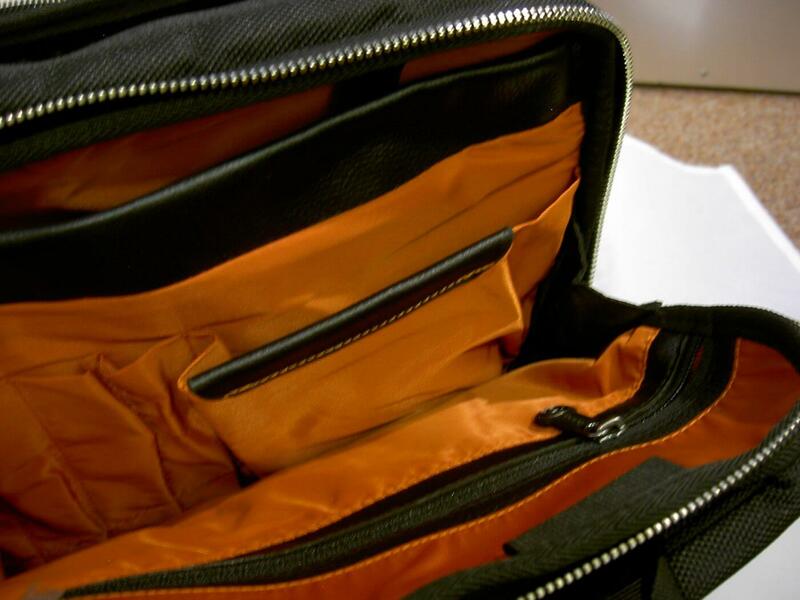 As the zips are covered with a layer of material, they look neat and tidy, with none of the zip teeth showing. For convenience, one of the side pockets has a detachable keyring, and while the arm straps can be adjusted for fit, any extra webbing can be neatly wrapped and retain with velcro to stop it flapping around. Finally on the rear of the backpack, there’s a pocket that’s just the right size for an ereader or 7″ tablet, which is handy for easy access. The Taipan Shock looks very smart in grey but for a bit of brightness a few coloured leather pull-tabs are included which can be swapped in. It’s a neat touch. 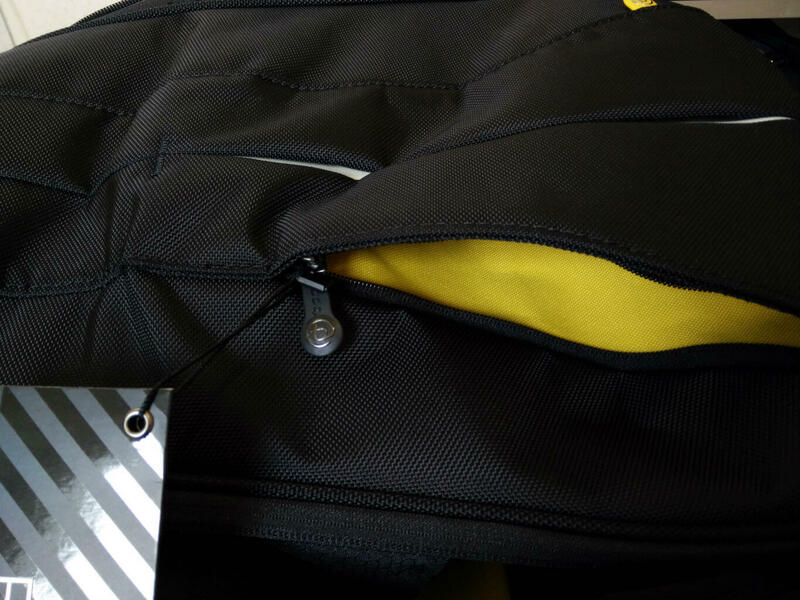 Finally, the Booq Taipan Shock comes with Terralinq, a service designed to reunite lost bags with owners. 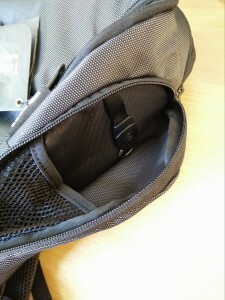 By pairing a serial number on the backpack with the purchaser, the Shock can be returned should it be found. Overall, the Booq Taipan Shock is a well-made backpack that has plenty of pockets and space for safely toting larger laptops. The Taipan Shock is vailable from Amazon.co.uk with an RRP of £80. Thanks to Booq for the loan of the Taipan Shock.